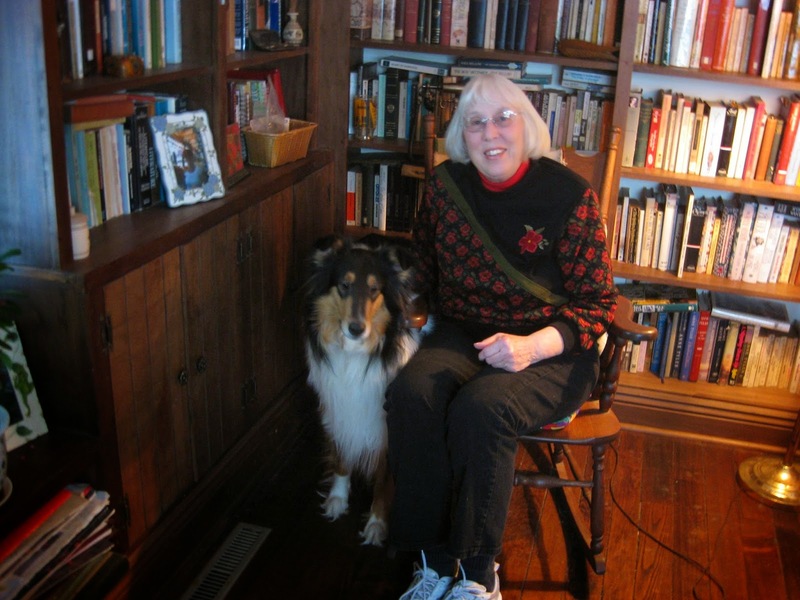 Gloria Alden describes herself as curious, optimistic and with a sense of humor. Her writing is small town cozy with interesting characters. I know Gloria and her stories and she’s telling the truth. Let's learn more about Gloria. I would invite Abraham Lincoln, my son John and my father. I’d invite my son because he died of cancer when he was eighteen, and there are things I would like to tell him as well as ask him about. I would love to listen to Abraham Lincoln and the stories he has to tell, and I know my father and he would carry on the most interesting and funny conversations. My son would enjoy it, too. We would eat at the Spread Eagle Tavern & Inn in Hanoverton, Ohio, a restaurant that also has rooms for overnight stays that dates back to the early 1800s, and a place where travelers stayed because the Sandy & Beaver Canal went through the area. Hanover was settled in 1813 by Quaker abolitionist James Craig, and the town was known as a safe-haven for runaway slaves. The historic inn was built in 1837. It has three floors, eleven rooms and twelve fireplaces. The ambiance is great with wood burning fireplaces in the winter, and a décor that fits in with its age. It also has delicious food. I’d like to think Abe Lincoln stayed there at one time although I doubt that he did. I write best at the table in my library/dining room/office or at my computer in the same room surrounded by books and with a large front window with numerous plants, and alone. I can’t write with people around me. A good or great short story needs interesting characters, a good plot and a surprise twist at the end. I read around seven books a month. Because I belong to two book clubs, my reading is eclectic and was even before I joined the book clubs. However, much of what I read is mysteries, but not necessarily in my genre. My most recent “great” book was The Cellist of Sarajevo by Steven Galloway, not a mystery, but conducive to much thought and discussion in the book club that picked it. The theme I regularly employ has something to do with gardening since my main character is a botanist who works for a large public garden and has a small garden center, but I also like to have a social theme whether it’s bigotry, environmentalism or something else that makes my books a little deeper than many cozies. The most challenging issue for me is probably run on sentences or slipping into an omniscient narrator voice – but I’m working on it and my three beta readers help me with that. I write in third person and have multiple points of view. What motivates me to write is the myriad ideas that keep running through my brain – so many that I could spend far more hours a day than I do not writing if there weren’t other things I also enjoy doing or must do. My books go by the month. I started with June and the latest book Murder in the Corn Maze (which is only waiting for a cover right now before it’s published) takes place in October. I thought a corn maze would be a good place to have a murder so a friend and I went to a corn maze. Of course, I still needed characters like the victim and the murderer and the reason he/she killed the victim. I start out with a list of characters both returning characters and always some new ones. I list the characters who could be suspects and why they might be, the victim, who is rarely a nice person, and I determine which of the suspects will be the murderer. I write bios for most of my characters, especially if they will be returning characters. I’m a pantser so I don’t always know what’s going to happen in each chapter, but usually the characters take over and do what they want to do and say what they want to say. I often have a subplot in my books as I do in the latest book, too. After finding five bodies over three months, Catherine hopes discovering bodies is over. Unfortunately, it isn’t. 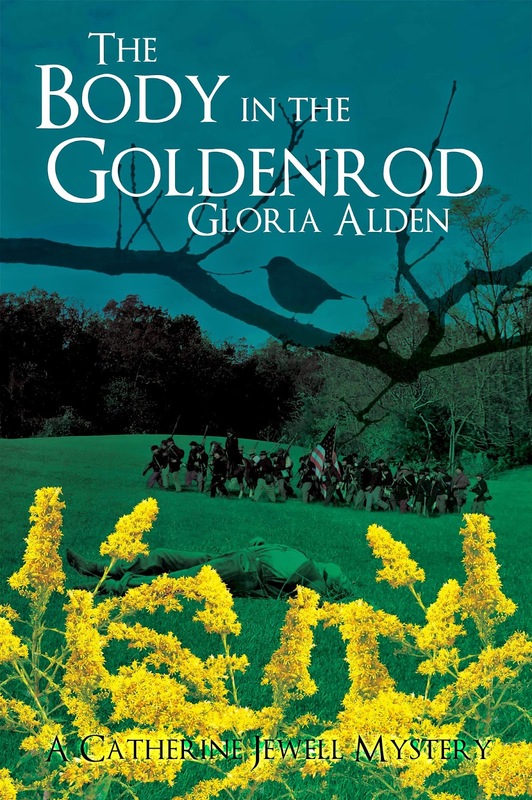 After a Civil War battle reenactment is over, Catherine notices what looks like a body in a field of goldenrod on the other side of the battlefield. The body is Daniel Webster’s, who had many enemies, making it hard to figure which of the suspects is the murderer or someone else. Catherine begins to believe she’s a jinx in Portage Falls and worries the residents will wish she’d never moved there. Between Catherine wondering who the murderer is and hoping it’s no one she likes, police chief John MacDougal’s mother, starts telling her about a backpacking trip she’d taken with environmentalist, Bruce Twohill. Catherine finds she isn’t the only one who discovers bodies. On the backpacking trip, Martha also found one; a woman in a group of birders they’d joined while backpacking. Thank you, Jim, for inviting me to your blog today. Gloria, I love your books! They are a wonderful example of small-town cozy--interesting characters, believable situations, settings that come alive for me. And murder. I love this series. (Can't have anything to do with the fact that I was invited to post on it). Knowing what lies in the hearts of some of my favorite writers is nourishing. Nice blog post, Gloria. Your writing process is much like mine. Those characters keep telling us what they want us to do. Love The Body in the Goldenrod cover. Thank you, KM. I do so love your Jesse Damron series,too. KB, I like it, too. I only regret that sometimes I forget it's up on Tuesdays. I'm going to put up a post-it note on my computer to remind me. Thanks, Polly. My step-granddaughter does a great job with my covers, it's only a problem because she's a terrible procrastinator. I've been waiting, waiting, waiting for the cover of my fifth book. She sent a rough draft I liked over a week ago and I haven't heard from her since. Procrastinator or not, Gloria, she's a talented young lady. I enjoy reading your Catherine Jewell books, Gloria! Your beautiful descriptions of plants and flowers make me feel like I'm walking in a garden. Polly, I agree with you that's why I'm not ready to look for another artist, although I did threaten her on the cover for "The Body in the Goldenrod." Thank you, Kara. Of course, now that I'm writing the November one, there isn't much on gardens. There wasn't that much in the book I'm ready to publish as soon as I get the cover, either. Not much blooming in NE Ohio is October.